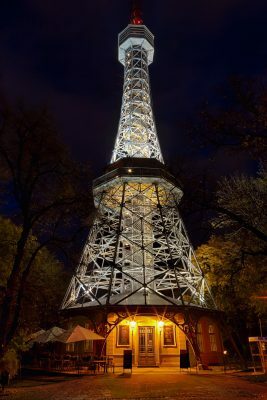 The Petřín Lookout Tower, known in Czech as Petřínská rozhledna, is a tower situated on Petřín hill on the left bank of the Vltava river in Prague. Due to its location and own height, it offers probably the best elevated views of the Golden City. If you happen to be a photographer, you will appreciate the fact that the view from the observation platform is unobstructed, without any glass. Therefore you don’t need to worry about reflections spoiling your photos. And the view is indeed magnificent, so if you catch good light, you should return with fantastic photos. The best way to get there by public transportation is to get off at Újezd tram stop. To see which lines stop there, please zoom in on the map and click on the tram icon. From there you can either climb Petřín Hill on foot, or take the funicular. The lower funicular station is called Újezd LD and it is just a very short walk away from the tram stop. The final stop of the funicular is called Petřín LD, and it is closer to the lookout tower than the intermediate Nebozizek stop. However, if you feel like taking a longer walk, you might also get off at Nebozizek and walk from there. The above map shows an overview of available paths. 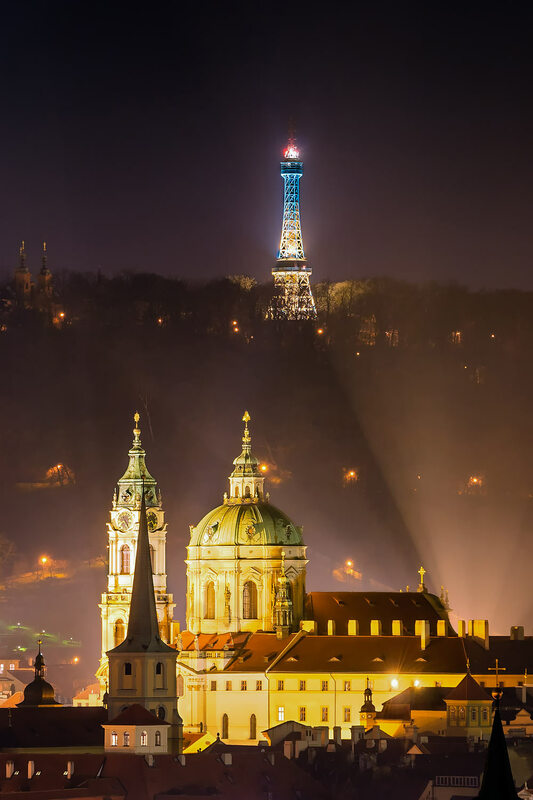 Prague Night Walking Tour will show you the enchanting beauty of the Golden City after dusk. An experienced guide will take you to amazing places and tell you stories about them. Tours are offered in the following languages: English, German, Russian. Check the price and book your tour. 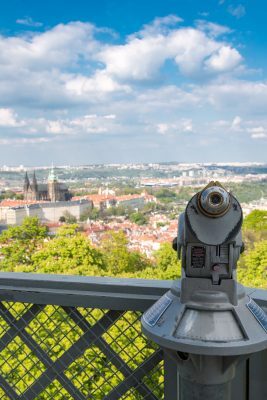 Prague Castle Walking Tour will show you the most important landmark in the Czech capital: Prague Castle. This tour is for all travelers who prefer sightseeing in an organized group. The tours are offered in the following languages: English, German, Russian. Check the price and book your tour. The construction of the tower was completed for the General Land Centennial Exhibition in 1891. It was a world’s fair held in Prague in that year. The tower was designed by the Czech architect Vratislav Pasovský and the construction is the work of two engineers: František Prášil and Julius Souček. 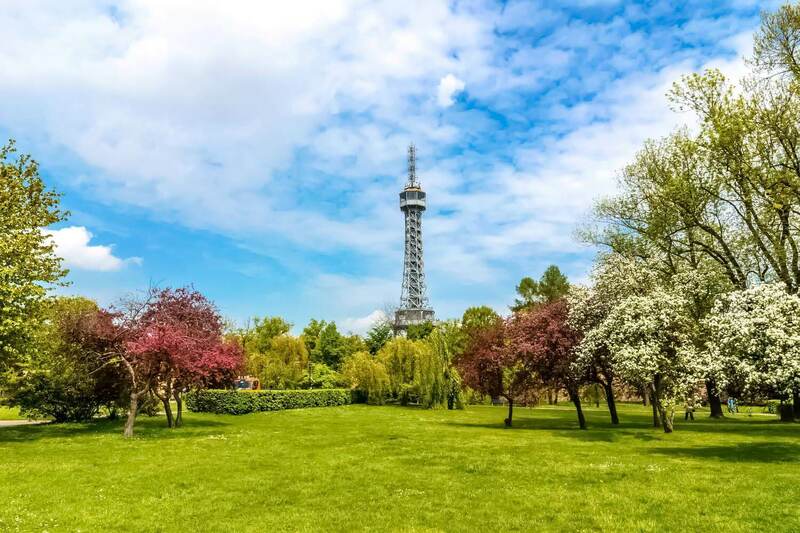 The overall height of the tower is 63.5 m (or 208 ft). The height of Petřín Hill itself is 318 m above sea level (1,043 ft). Certain similarity to the Eiffel Tower in Paris is undeniable. However, there are also significant differences. The cross-section is octagonal, and not square, as in the case of the Eiffel Tower. 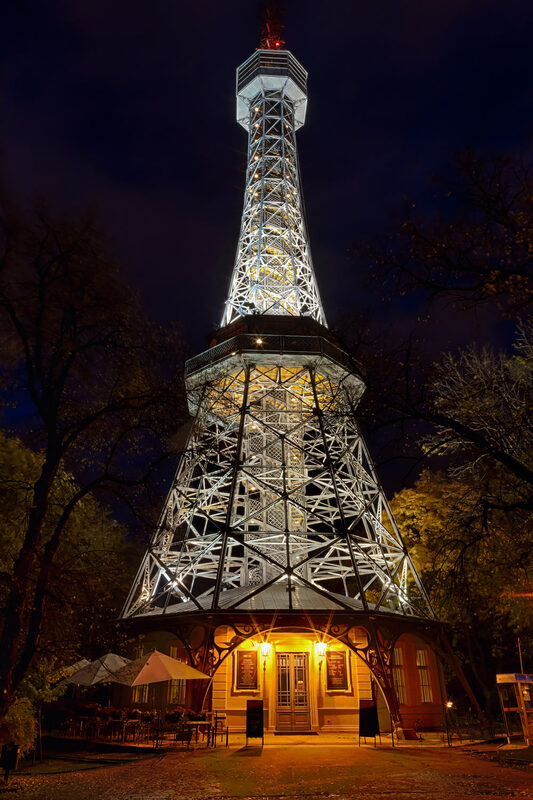 The Petřín Lookout Tower does not stand on four columns of lattice steel, like the Parisian tower does. The entrance hall of the Prague tower takes up the whole space below the tower’s legs. The observation platform is at the height of 51 m, counting from the base. However, when you add also the height of the hill, the true altitude of the platform will be significantly higher. And if you find yourself at such altitude above Prague, the view must be amazing. 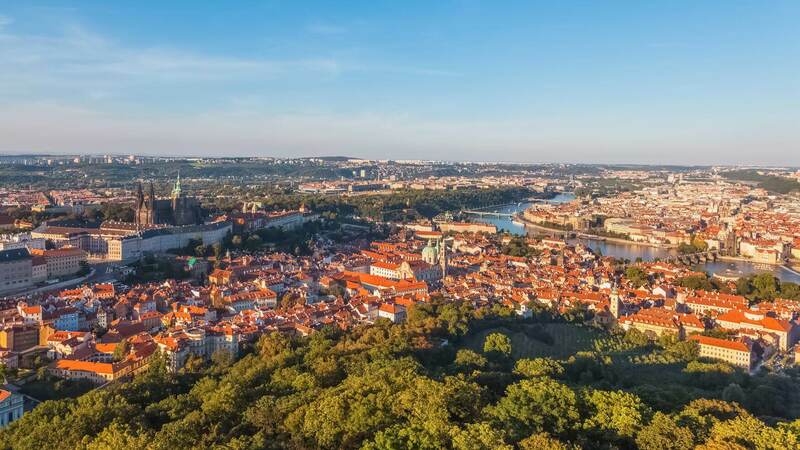 And this view is the reason why the Petřín Lookout Tower is visited by more than half a million people every year. Isn’t this view magnificent? On the left you can recognize Prague Castle, and on the right obviously Charles Bridge and the Old Town. If you’re still hesitating whether you should visit the Petřín Lookout Tower, maybe this photo will convince you. If you are already convinced, you can check the opening hours and entrance fees on the homepage of the tower. 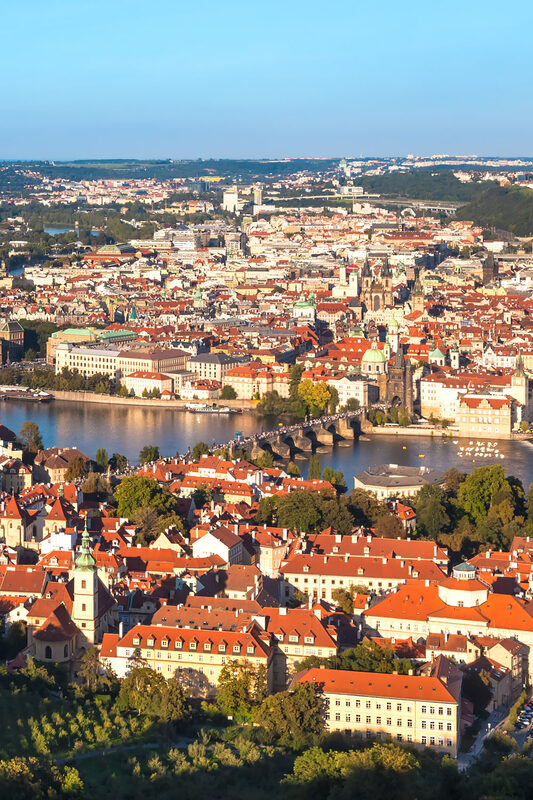 Are you coming to Prague by plane and need simple transportation from or to the airport? Booking your airport transfer service in advance will save you the hassle of using public transportation and will protect you from being overcharged by street taxis. Prague Airport Transfers is the market leader in Czechia, providing its services since 2006. Since then, millions of passengers have chosen their convenient transfer and private transportation services for a fixed price. The fleet consists of sedan cars, minibuses and limousines. Your English-speaking driver will take you to your hotel in Prague or even to other cities in Czechia and Central Europe for a fixed price. Check the prices and book your transportation.